So we survived the Mall, which wasn't too busy on the whole. There was a fair bit of waiting around though, so we entertained ourselves by drinking hot chocolate from the opticians' machine and trying on bright orange glasses (me, couldn't resist). After a while we repaired to the book shop which was really busy. I felt sorry for the shop assistants, it was such a squeeze that people kept knocking the books off of the tables with their bags. We left as soon as we could, which was after what seemed like two hours. Yesterday I took the boys down to the allotment to pick the Christmas sprouts. Do other countries have sprouts for lunch on Christmas Day or is it just a British thing? I love them, it wouldn't be a proper lunch without them. Next year I'd like parsnips from the plot for Christmas lunch as well, but this year it will just be sprouts. Everyone has said they'll eat at least one! Although if they don't I shan't mind. But I think there's a mysterious allure in growing your own, the children are more likely to eat a home grown thing than a shop one. Annual flowers, leafy greens, Mrs Pig on the grass, sunshine on the beach, the ice-cream van and some palm trees. Have I convinced you it's summer yet? The pictures are all from the last three days. Today, the winter solstice, wasn't quite as glorious, there was horizontal rain at football this morning. The littlest boy was pale and peaky and was taken home. Me and the biggest boy stuck it out to watch the middle boy's match. We hunkered down at home for most of the afternoon, although we did pop out at about half past four, half an hour after sunset, for a quick walk around the neighbourhood to look at Christmas lights. All in all it's been a lovely calm weekend. I'm very happy to be tucked up in a warm cosy home, and I'm very happy to stay away from all the festive madness too. Alas, tomorrow may be a different story. Other half's glasses broke this afternoon, so we must to the mall. The earliest appointment he could get was at lunchtime. I'm not sure he's fully appreciating what we will be facing there three short days before Christmas. It will not be pretty. I'm dragging the children along as well. The littlest boy left his winter coat at school on Friday, and as it's rather small anyway I'll look for a bigger one for him. And the biggest boy is muttering something about his toes being at the end of his school shoes. Sigh. They do keep growing don't they? Eating and growing, eating and growing. In other news the middle boy is currently enjoying a book of practical jokes. This means that things are popping out of everywhere at me, and falling down off the tops of doors. It keeps it interesting. Both pairs of roller skates arrived. I was very relieved. I took the littles to see Father Christmas in town yesterday. He asked them what they wanted for Christmas. As they were momentarily struck dumb, I mentioned that the middle boy had asked for roller skates. He said, "No I didn't." Father Christmas had a really good laugh at that one when he saw my face. Wishing you all a good few days in the festive run-up. Do you have much left to do? Any last minute tips for retaining sanity? I'll be back when I've braved the mall. I may be some time. Five slightly festive things that I've been enjoying this week. Candlelight on glass. It always makes a room look quite special. I find that it's best enjoyed after fire-loving boys have gone to bed though. What is it about boys and danger? They're like, well, moths to flames. Rope swings in the woods. More things that boys love. I really enjoy watching them have good healthy outdoor fun, and it's a pleasure at the moment to get outside somewhere where there's space and cold clean air. School has become a bit claustrophobic this past week or two. It seems to be endless party days and hours of watching DVDs. It sounds good, but to be honest they're fed up with it now. Mince pies at dawn. Way before dawn in fact. I don't always sleep well, I was up at 5 o'clock this morning, so I made some mince pies with the cranberry mincemeat I made the other day. I even tiptoed off and got my camera. It's important to bake quietly at 5am. I'm a bit obsessed with beech hedges at the moment. They really come into their own at this time of year. Suddenly you notice them everywhere. In the summer they blend in a bit more. I love how they retain their leaves for a long time. It means that even though they're deciduous they're still a screen even in the winter. And with the sun on them, they're gorgeous. I've put pictures here before of lollipop shaped beeches and a beech arch, it makes me wonder if I could squeeze one into the front garden. It was the school Christmas carol service tonight. It was in turn beautiful, moving and hilarious. The lights were turned off and solo voices sang sweetly in the candlelight. The tiniest people dressed as nativity characters and sang a verse of Away in a Manger. Toddlers charged about the place, shaking the Christmas tree violently and yelling to go outside. A cartoon about the meaning of Christmas was handed out to everyone. The biggest boy had done it. Little bit proud of him. The middle boy played the recorder very nicely. The littlest boy conducted the recorder group from where he was sat with his class. He had the flashing lights on his shoes turned on and had possibly smuggled in a Loom band bracelet, all of which is highly forbidden. We play to our strengths around here. Joining in with Five on Friday, taking five minutes from our day to enjoy five things. To visit the other bloggers joining in this week, click on the links below. Red, gold and green, the colours of Christmas and the colours of spice. The warmth of their colours and flavours are perfect for these chill days. Whilst the fresh, clean tastes of spring and summer happily stand alone, in winter we look for a little extra, the complex unmatchable flavours and aromas of spices. The hot colours of orange, yellow and red are dominant, the warmth and depth of spiced food is perfect for cold dark days. These precious compounds have been revered for five thousand years or more, causing wars, founding trade routes and shaping history. Coriander, fennel, juniper and cumin were found in the tombs of the Egyptian pharaohs. Black pepper, cinnamon, ginger and cloves were around in the Middle Ages. The unique flavours were so treasured that spices were worth vast sums of money. Pepper and other spices have been used as currency, and nutmeg, which was for a while used to prevent plague, has at times been worth more than its weight in gold. When I was twenty-one I spent a while cycling around Morocco. 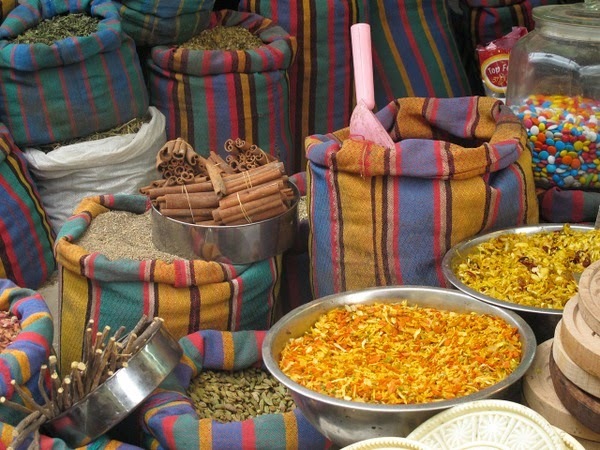 The parts I enjoyed most were the souks, where everything was for sale, from the delicious Moroccan bread that I've never been able to replicate since, to little silver teapots for mint tea, and richly coloured carpets. But the most amazing displays were on the many spice stalls. 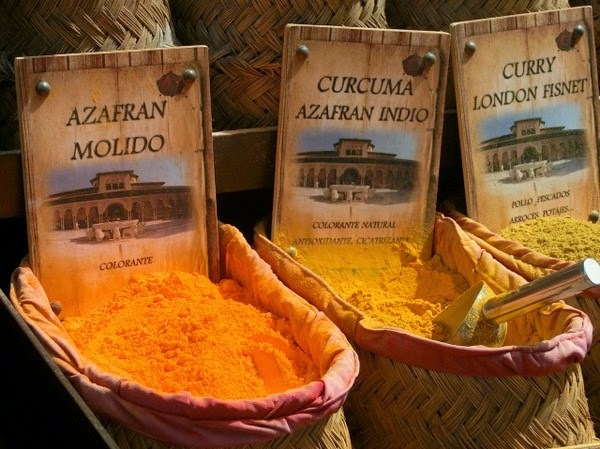 Powders of every shade of orange, yellow and red piled high in wide bowls. It makes me think that we under-utilise spices here, buying them in tiny glass jars and little glassine bags. 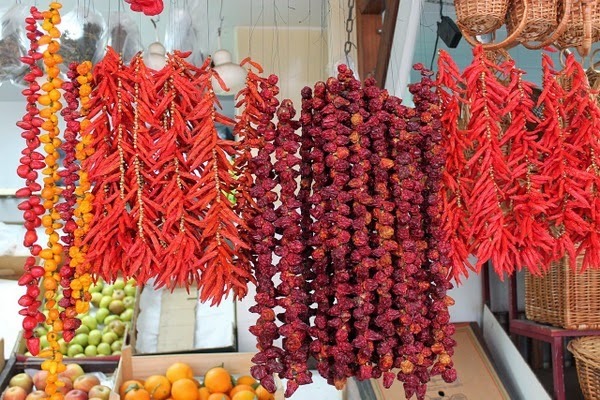 When I see the drama and colour of a North African spice stall I wonder if I might be missing something. 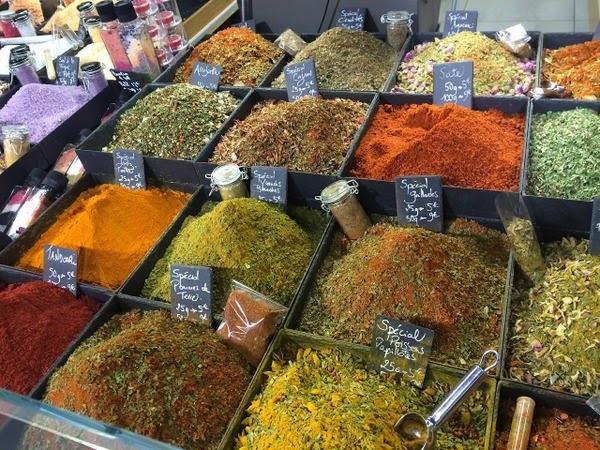 The health benefits of spices are only now starting to be documented, and I'm convinced that many of them have considerable positive effects on human health. I often read that it's good to eat a rainbow of foods, somehow in the vivid colours there is magic. 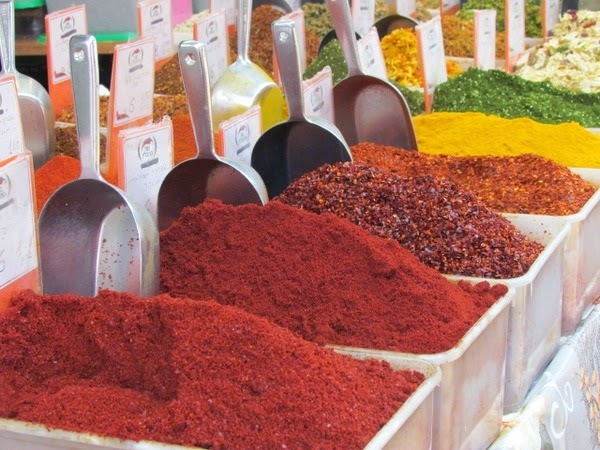 And where better to find these deep, saturated colours than in spices. This Christmas I'll be using more spices and different spices, and it's something I'll try to keep up in the New Year too. I could use a little ancient magic. When it comes to big events, I like to hold my nerve as long as I can before I start panicking. It's a strange thing, but almost everyone who knows me seems to think I'm calm and laid back. But inside I feel I'm exactly the opposite. It's a strange dichotomy. I'm not sure how I come across in this space. Calm? Frantic? Nervy with a light edge of hysteria? I find myself saying, "YOU HAVE GOT TO BE KIDDING" quite frequently. But on the whole I can usually see the bigger picture enough to keep a tenuous grip on things. Right now I'm in the nerve holding phase of Christmas. Any minute now I'll break into the panic phase, I can feel it coming on. I made mince pies this week, but they've almost all been eaten now. That's the trouble with festive baking isn't it. The tree is up and decorated. I've had Christmas cards from Christina and Sara, and Christina sent a sweet little crochet star that I've put on the mantelpiece. I've got those nice oranges that come with leaves on at this time of year. It fools me into thinking that they're nice and fresh from the tree. Christmas reading includes Nigella's "Feast" for the seasonal recipes and Joanne Harris's "Lollipop Shoes", the sequel to "Chocolat". It's made me a bit obsessed about chocolate, she writes so beguilingly about it. I've written down a truffle recipe in my notebook as well as Sue's recipe for florentines. The biggest boy has requested a Bruce Bogtrotter's cake. It's from our Roald Dahl recipe book. I'm an absolute sucker for this kind of cookery book. I've bought the Winnie the Pooh one for the littlest boy for Christmas and I've had the Moomin one from the library too, it's excellent. I think it helps me live in a fantasy world of rabbit holes and Scandinavian adventures. I've perfected the art of avoiding reality when required. I'm also reading Jostein Gaarder's "The Christmas Mystery" to the little people, one chapter a day during advent. It's lovely to have a book that stretches out nicely over December. Are there any others like this? I don't know, but I shall look out for one. On the gift front I've managed to avoid the shops, and we had another lovely walk on Saturday, miles from the busy places. Father Christmas has been ordering online, but there's been a little snafu with the skates that you will recall the littlest boy requested. FC, in a moment of festive absent-mindedness, ordered the wrong size - the size that would fit the middle boy. I made discreet enquiries of the middle boy. Did he fancy skates for Christmas? He couldn't think of anything before, so he'd decided to have money so that when something catches his eye he could have that. He's a lot like me, he agonises over every choice. I'm the one who stands in the toothpaste aisle at the supermarket for twenty minutes paralysed by indecision. Anyway, he gave it some thought and decided that he didn't know if he wanted skates or not, so he wouldn't have any, but if he did want some later he could buy some. So FC returned the skates and crossed his fingers that the replacements would turn up in time to avoid disappointment. Two days later I had a conversation that went something like this. "Mummy?" "Yes sweetie?" "You know you asked if I wanted skates for Christmas?" "Yes..." "I've decided I would like some please." FC has spent some time on the phone today trying to sort it all out. There is a distinct possibility we'll end up with three pairs, not all from the same place. It's too complicated to go into, but no doubt you've had these exact moments yourself, you know how it goes.